Russia is an independent republic in Eastern Europe and Asia, which was established on December 25, 1991. Officially named the Russian Federation , Russia was once the largest and most prominent republic of the Union of Soviet Socialist Republics (USSR). In 1991 the USSR collapsed, and Russia became an independent country. One hundred forty six million people live in the Russian Federation. Four fifth of its population are Russians. Besides more than 100 people and ethnicity groups inhabit Russia. The Russian Federation includes some Sovereign Republics, regions, districts, and some of them are also multinational. The capital and largest city of Russia is Moscow. Other major cities include Saint Petersburg, the second largest city; Novosibirsk, the largest city in Siberia; Nizhniy Novgorod, the largest city on the Volga River and a major automotive and shipbuilding center; Yekaterinburg, the largest city in the Urals. More than 100 languages are spoken in Russia, and some of the ethnic republics have declared their own local state languages. The Russian language, however, is most commonly spoken in business, government, and education. Religious expression, which was controlled by the Communist Party of the Soviet Union (CPSU) and strictly discouraged for nearly seven decades, has unfolded in a myriad of different beliefs, sects, and religious denominations since the dissolution of the USSR. Missionaries from abroad and other proselytizers have introduced a wide variety of religious beliefs and new-age philosophies to Russia. Most of the religious revival has resulted in the resurgence of traditional religions, particularly Orthodox Christianity, but also other forms of Christianity, Islam, Buddhism, and Judaism. Russia is the largest country in the world, with an area of 17,075,200 sq km (about 6,592,800 sq mi), more than one-ninth of the world’s land area and nearly twice that of the United States or China. Russia is so large that the climatic differences of various parts are great. You can hear a tintinnabulation of Russian chimes (mp3 file@ 220KB) The surface of my Motherland is various. It has mountains and hills, lowlands and highlands, grasslands and deserts. Russia is rich in natural resources such as oil, natural gas, coal, iron ore. The forest covering vast areas is a real treasure of Russia. 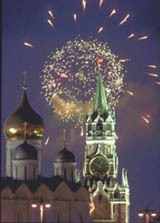 The Russian Culture has always been considered a unique one in the world. The history of Russian literature, music, ballet, and drama includes some of the greatest artists and works ever produced. Much of this art flowered in Russia during the 19th century. Russian achievements in literature, music, ballet, and drama are also well represented in a wide variety of cultural institutions. The country contains a wide variety of tourist attractions. Primary cultural attractions include czarist retreats near Saint Petersburg, the Old Town of Novgorod, the Golden Ring of medieval towns surrounding Moscow, and numerous museums, galleries, theaters, and architectural points of interest in the cities of Moscow and Saint Petersburg.